Recently, I was double-checking the footnotes for a book that is coming out this year. It is an updated version of a book I published ten years ago, and in the new version I wrote the sentence: “Furthermore, foods prepared outside the home tend to be higher in calories and fat and generally less nutritious than foods prepared at home” (Vyse 2018). I supported this statement with a footnote citing a U.S. Department of Agriculture (USDA) website “Food-Away-from-Home,” which is maintained by the USDA’s Economic Research Service. I originally accessed the site on December 28, 2016, so just to make sure the information I needed was there, I clicked the link again. What I found was shocking. The screenshots below of the old and new versions of the page are too small to read, but you don’t need to read them to see what’s going on. Screenshots of the USDA “Food-Away-from-Home” page on two different dates. By consulting the Internet Archive Wayback Machine, I was able to retrieve the December 28, 2016, version of the page I originally consulted. At that time, the page included a graph of food away from home as a share of total food expenditures over a forty-year period, a link to download the data from the graph in an Excel spreadsheet, summaries of research findings, and links to peer-reviewed articles and to USDA publications. The 2018 version eliminated all of the text of the main article except for two short paragraphs and four bullet points. Furthermore, in 2016 that introductory material included seven hyperlinks to additional sources, but there are no hyperlinks in the current version of the page. If you want to compare the two for yourself, this link goes to the archived 2016 version of the page, and here is the link to the current version of the page. At the bottom of the “Food-Away-from-Home” page—both versions—there is an email link to a USDA scientist to contact “for more information,” so, identifying myself as a writer for Skeptical Inquirer magazine, I emailed the scientist and asked why the information had been removed from the page. To my surprise I heard back an hour later. The scientist forwarded my question to Carolyn Rogers, who is the Assistant Director for Communications for the USDA’s Food Economics Division. Rogers responded to the scientist and asked that he forward her response to me. Her email is presented below. Meals and snacks based on food prepared away from home contained more calories per eating occasion than those based on at-home food. Away-from-home food was also higher in nutrients that Americans overconsume (such as fat and saturated fat) and lower in nutrients that Americans underconsume (calcium, fiber, and iron). The page also cited and linked to several research studies examining the relationship between eating away from home and obesity. In addition, the original text pointed out that much of the food offered away from home is exempt from food labeling laws that apply to grocery store items. Finally, the page provided a brief summary of a peer-reviewed study showing that consumers with greater food knowledge ate less red meat (beef and pork) both at home and away from home. Incidentally, one part of Ms. Rogers’s email is quite accurate. Most of what remains on the “Food-Away-from-Home” webpage describes the functions of the Economic Research Service. 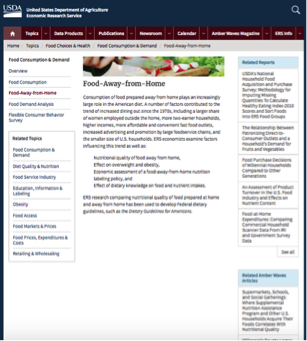 There is almost no information about food purchased or consumed away from home remaining on the page. As we all know, the United States has a serious problem with obesity. A study published in the Journal of the American Medical Association in March showed that, between 2007–2008 and 2015–2016 obesity among youth rose from 16.8 percent to 18.5 percent—a difference that was not statistically significant. (Good news!) However, during the same period, obesity among adults increased from 33.7 percent to 39.6 percent, a difference that was substantial and statistically significant. (Not good news.) The rate of severe obesity in adults also rose significantly over the period of study. To put these findings in context, roughly 40 percent of American adults are not merely overweight but obese, which means they have body mass indexes (BMI) of 30 or greater. For an adult who is 5’10” a BMI of 30 is equivalent to a weigh of 209 lbs. Obesity is a significant risk factor for type 2 diabetes, cardiovascular disease, stroke, and cardiovascular death (“Health Risks” 2016). Heart disease has multiple causes, but it remains the leading cause of death in the United States. Stroke is fifth on the list, and diabetes is seventh (Centers for Disease Control 2017a). 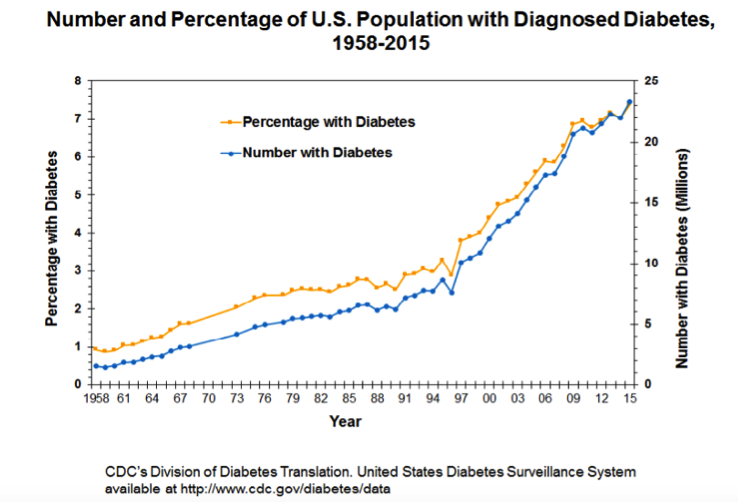 The graph below—taken from a Centers for Disease Control and Prevention (2017b) report—shows that the percentage of the U.S. population diagnosed with diabetes has increased from less than 1 percent in 1958 to 7.4 percent in 2015, and the rate of increase has been particularly rapid over the last two decades. This sad tale of a single USDA webpage is undoubtedly not unique. I have not attempted a comprehensive survey of health information on the USDA website—nor of the many other government agency websites that provide health information—but it seems unlikely this is the only one that has been scrubbed. Although the recent removal of the phrase “climate change” from the website of the Environmental Protection Agency (EPA) has received considerable attention, the politicization of science information is not unique to the EPA, to this administration, or even to Republican administrations. For example, the food pyramid program, often used in nutrition lessons for school children, also fell under the auspices of the USDA, and it had a famously political history. The role of food industry lobbyists in the development of USDA nutritional guidelines has been documented at great length (e.g., Nestle 2007), and the sordid tale is far too involved to summarize here. But a quick look at the current program shows that lobbyists are still shaping the nutritional guidelines given to children and adults. 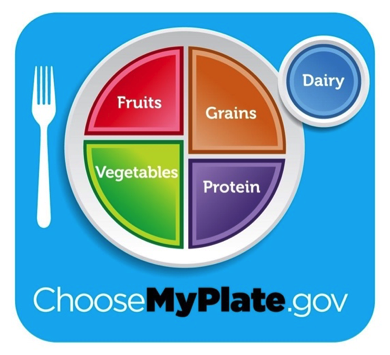 Current USDA Nutritional program diagram. HSPH removes dairy from its vaunted position in the upper right-hand corner and encourages people to drink water, tea, or coffee. Potatoes and French fries count as vegetables for the USDA (! ), but not for HSPH. HSPH encourages the use of healthy oils (olive or canola) in cooking and limiting the use of butter. HSPH gives a clear recommendation that red meat should be limited and processed meats should be avoided altogether. 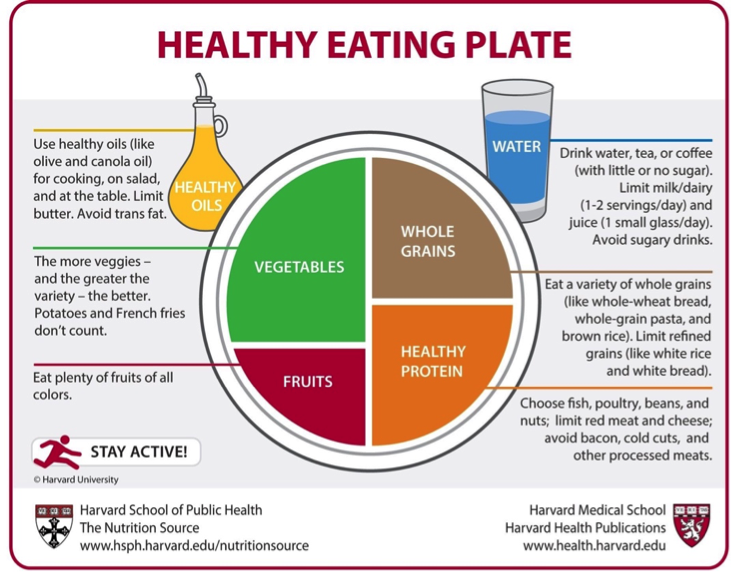 Harvard School of Public Health alternative to the USDA MyPlate guidelines. Obesity is a problem with a strong behavioral component. Of course, for individual people, genetics plays a role, too, but skyrocketing rates of obesity and diabetes cannot be explained by some kind of supercharged natural selection process. Nor am I convinced that there has been a wholesale moral collapse over recent decades. Rather much of the explanation for our growing girth can be found in our behavior and in an environment increasingly rich in inexpensive and highly caloric food. It is unlikely that the fast food restaurants and drive-thru windows are going to disappear any time soon, but with the right information and a little encouragement we can change our behavior. Unfortunately, we are not getting enough of that information from our government. Pro-business lobbyists and industry groups have attempted to blame the obesity crisis on a lack personal responsibility and have advocated for increased consumer freedom1. But what if you actually do want to take personal responsibility for avoiding obesity? If you are a consumer who wants to learn about healthy eating, you will find less and less of the information you need at the USDA. I have direct evidence that there are health scientists working at the USDA, and by all indications they are doing good and important work. But their findings are not being shared with the people who could benefit from them. This is particularly unfortunate because government agencies can speak with a unique kind of authority. In a democracy, we are led to believe that the government’s foremost concern is for the well-being of its citizens. We tend to trust the government’s health and science recommendations. Unfortunately, when it comes to getting science-based information about how to eat a healthy diet, the USDA is far less helpful than it could or should be. I am surprised by your write-up. ERS website goes thru periodic revisions to highlight more recent research and to facilitate the use of our data and findings after receiving feedbacks from users. For example, we are in the process of revising the page on diet and health as we have more recent publications to disseminate. The revisions are done as needed and its timing is pretty much up to the researchers and their supervisors. In his email response to me, the scientist copied Carolyn Rogers, the Assistant Director for Communications for the USDA’s Food Economics Division. I replied to both the scientist and Ms. Rogers by simply asking: “Do you believe the current page is an improvement over the previous one? If so, how?” Five days later, I have not received an answer to my questions, and the USDA “Food-Away-from-Home” page remains stripped of most of the information that was there in December of 2016. Centers for Disease Control and Prevention. 2017a. “Leading Causes of Death. March 17. Accessed March 30, 2018. https://www.cdc.gov/nchs/fastats/leading-causes-of-death.htm. “Health Risks.” 2016. Obesity Prevention Source. April 13. Accessed March 30, 2018. https://www.hsph.harvard.edu/obesity-prevention-source/obesity-consequences/health-effects/. Nestle, M. 2007. Food Politics: How the Food Industry Influences Nutrition, and Health. Revised edition. Berkley: University of California Press. Vyse, Stuart. 2018. Going Broke: Why Americans (Still) Can’t Hold on to Their Money. Updated edition. New York: Oxford University Press. See, for example, the Center for Consumer Freedom, a non-profit founded by the head of a Washington public relations firm. According to Sourcewatch.org the Center for Consumer Freedom is funded by Coca Cola, Wendy’s International, Tyson Foods, and Outback Steakhouse, among others.